"We had to walk to the Bristol for all our meals. Sometimes they weren't worth the walk." An exterior view of the Hotel Bristol. 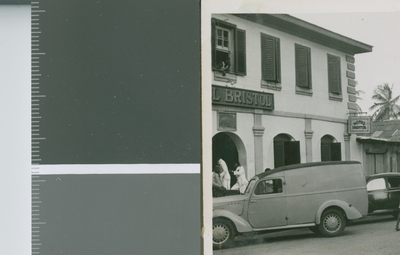 This photograph comes from an album that recounts Eldred Echols and Boyd Reese's visit to Nigeria in 1950. The Lawrence Avenue Church of Christ in Nashville, Texas asked the two missionaries to visit Nigeria and report on an emerging indigenous Christian movement whose leader participated in a Bible correspondence course run by the Tennessee congregation. Upon their arrival, the missionaries found several thousand Christians led by Coolidge Akpan Okon Essien, from the Efik tribe in Eastern Nigeria, whose doctrine and practice were similar to that of American Churches of Christ. photographic print, 6.5 x 9 cm.